Our website is currently being redesigned, more content coming soon. If you have an enquiry please click the email button top right of this page. Based in Barnsley, we are predominantly a business to business engraving service but we do also deal with the general public by prior appointment. If you wish to discuss your engraving requirements in person please contact us by telephone or email first to make an appointment. Industrial push button legend plates or nameplates. Rigid Laminate (Also known as Phenolic or Traffolyte) - 1.5mm & 3mm - Click here to see a colour swatch. 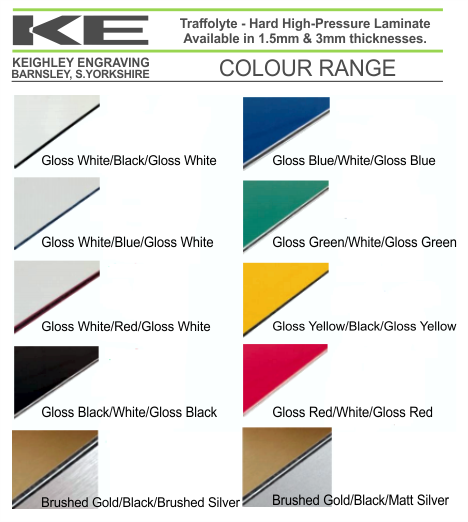 Exterior Quality UV Stable reverse engraved abs/clear acrylic in a choice black/clear, white/clear, silver/clear, gold/clear. Trophy Aluminium (Choice of Bright Gold, Bright Silver and Gloss Black). Our regular clients particularly value the quality and workmanship that goes into every engraved product. Our approachable, friendly and flexible service has helped us to maintain good working relationships with our clients that we will nurture for the future. Whether you need a standard engraved sign or something a little different, we'll make sure you get exactly what you want. © 2019 Keighley Engraving, All rights reserved.